Iberogast is Dr. Oz’s worry cure for the stomach. When we worry, our digestive system tends to pay the price. Either our digestion slows down, you get heartburn, bloating, cramping or diarrhea. Iberogast has you covered and it is one of Europe’s BEST kept secrets. At Alive Health Centre, Morning Sun and Supplements Plus, we have been recommending this fabulous product for years! We have many customers who rave and pass on their recommendation to their friends constantly. 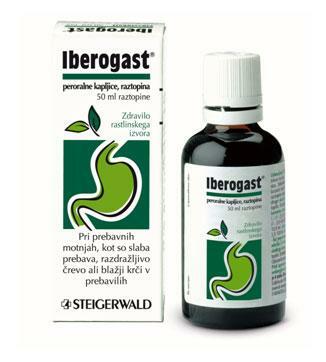 Iberogast is a clinically proven prokinetic medicine which relieves heartburn, bloating, cramping and abdominal pain. It is also used in patients with chronic problems such as irritable bowel syndrome and functional dyspepsia. Amazingly, Iberogast is nothing new. It has been around for over 45 years in Europe! It has been in the US and Canada for a few years, but is not as well known just yet. Iberogast is comprised of the following 9 ingredients: Iberis amara, Angelica, Chamomile, Caraway Fruit, St. Mary’s Thistle, Balm Leaves, Peppermint Leaves, Celandine, and Liquorice Root. Iberis amara: The fresh plant extract of Iberis amara represents the prokinetic component in Iberogast. It increases the tone of smooth gastro-intestinal muscles and accelerates gastro-intestinal peristalsis. Extracts of Iberis amara are only contained in the medicine Iberogast. Angelica: The extract acts to promote digestion, to relieve cramps and to promote gastric juice production. St. Mary’s Thistle: The extract acts in an hepatoprotective manner and stimulates the regeneration of liver cells. Caraway Fruit: The extracts act in a microbicidal manner and relieve cramps. It improves the tolerability of flatulence promoting foods (e.g. cabbage, beans). Lemon Balm Leaves: The extract acts as a seda-tive and in an anti-flatulent manner. Celandine: The extract acts to relieve cramps in bile ducts and in the gastro-intestinal tract. Liquorice Root: The extract shows a cramp-relieving action and accelerates the healing of stomach ulcers. Peppermint Leaves: The extract acts in an anti-flatulent manner, relieves cramps and stimulates bile production. Chamomile: The extract is anti-inflammatory, antibacterial, cramp relieving and promotes wound healing. 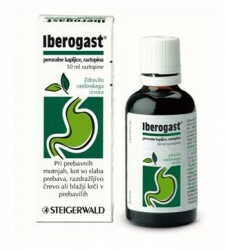 Unless otherwise prescribed, Iberogast should be taken orally three times a day before or with meals. It may be mixed with your favourite drink. Sleep Deprived? Marilyn Denis Show Answers! Iron Smart by Lorna Vanderhaeghe: Helps Fight Fatigue, Anemia Hair Loss and MORE! Hi there, thank you for your interest. We do not have any locations in the US, but if you are unable to find Iberagast Liquid we do mail orders all the time. You can call 1 866 499 9546. Can’t find IBEROGAST in BC CANADA anymore can u help? Hi Jeanette, thank you for your comment. Unfortunately, we do not carry this product any longer. I am not sure who carries in Canada anymore.